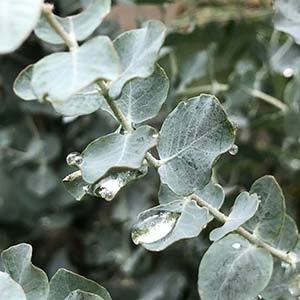 This is a small growing species and as Eucalyptus kruseana will only reach around 5 metres in height it is suited to smaller gardens. Grown for the attractive foliage as well pale yellow flowers, the trunk itself with good coppery tones is also a feature. This is a Eucalyptus kruseana that can be pruned back hard. It will reshoot from a lignotuber and this will allow the plant to completely regenerate and refresh the foliage. This habit also makes it suited to use as a hedging plant or low informal screen. Without pruning the tree will usually grow with a single trunk. Eucalyptus kruseana is a small Eucalyptus, it makes an interesting specimen tree in a dry open position in the garden. Dig the soil over well before planting and ensure that drainage is good. Plant and stake the young plant. Water in with a liquid sassed fertiliser. Water occasionally through dry periods in the first summer. Once established little care is required. An annual application of a low phosphate native plant fertiliser may be beneficial in very poor soils. If you are going to prune the plant, prune it hard back to the ground. This is best done just before new growth is about to commence. The method of propagation is usually from seed. Common Name – Bookleaf Mallee. Botanical Name – Eucalyptus kruseana . Foliage – Blue – Grey. Flowers – Yellow to Creamy Yellow. Height – Dependant on climate and soil to around 2 – 3 metres. Spread – Will form a crown of around 2 metres.